When we last left our Fenrirr Hunter, he had fulfilled his contract by dispatching the witch with a swing of his ax. You've earned your pay, and the residents of Shadetown are happy to let the missing girl with the red cloak fade from their memories. 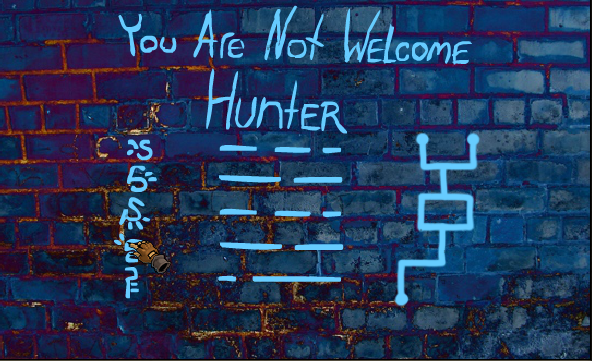 Maybe it was because they seemed so eager to forget, that Hunter thought it all the more important to find her. But the path took him deep into the forest, right to the precipice of a portal to another world. And wolf could possibly prepare himself for what he sees through it. Come then, one last time to Hyptosis' faerie tale world of magic and arcane science for the final installment of his atmospheric point-and-click adventure saga, Hood: Episode 4. 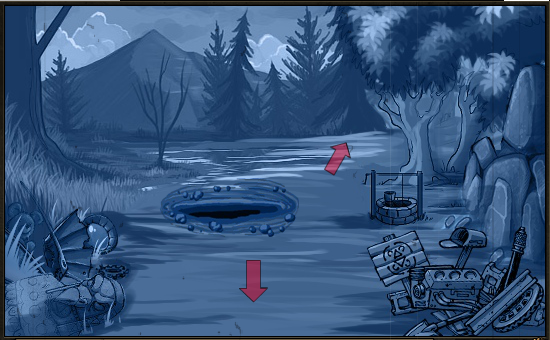 Mechanics are similar to the previous episodes: Use the mouse to click the red navigation arrows to navigate yourself through the spirit world. Mouse the cursor onto items to get a description, or click to manipulate or add them to your inventory. Once in your inventory, items can be selected in order to give them to other characters or "use" them on part of the scenery. 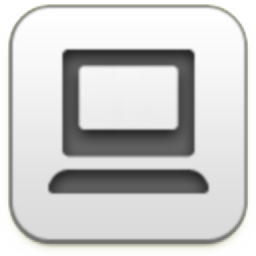 If a character is on-screen, you may click to talk to them, and ask various questions by selecting them in the conversation window. Find where the Hood went, why she's there, and if she can be saved. The plotting and programming have improved with each iteration of the Hood series, and Episode 4 is no different. If the first three games were set-up, then this is the pay-off: questions are answer, loose ends are tied, and a final confrontation is had. While the previous games had arcane spookiness, this conclusion adds an edge of the psychological that makes things deliciously unsettling. Of course, with Hood's undercurrent of whimsical humor, it's hardly a dreary experience: There's a snarky reply every time you try to use an inventory item on a piece of scenery illogically (especially when you're wielding your slightly-moldering friend Mr. Pumpkin), and the annoyingly cheerful fire sprite will crack you up. A bit of pixel-hunting for items mars the experience, as does a obtuse magic runes puzzle late in the game. Still, Hood is an enjoyable final visit to a beautifully constructed and illustrated world. Will this story have a happy ending? That's something players must see for themselves. 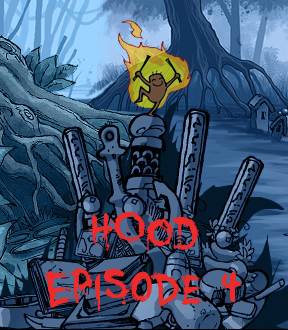 Hood: Episode 4 Walkthrough now available! The Series: If you haven't played them yet, I recommend going back and enjoying the first three episodes before continuing into this one, the final installment of the Hood series. Narrative: Most the story in this narrative adventure develops through the conversations. So click around everywhere, use your inventory on everything, and talk to everyone as much as possible. To avoid missing parts of a conversation, take care that you do not have an item highlighted in your inventory for use when you first click on someone to talk to them. To see all parts of the conversation, you'll need to replay the game. You'll need to solve a puzzle to continue. Solve the puzzle by clicking the symbols on the left until you've changed the lines in the middle to the proper arrangement. Each line has a corresponding symbol/button and each time you click on the button, the lines change. The design on the right side of the wall is your main clue. Pay attention to the spaces. Imagine placing the design on the right over the lines in the middle, where would they intersect? When you have changed each line correctly, the wall dissolves away and you'll be facing a new scene. At the Gate, Elder Shade "...to the side of Them." Talk to the Elder Shade, clicking through the entire conversation. When you're given a choice what to say, pick the one you want. After going through the full conversation, the Elder Shade leaves. 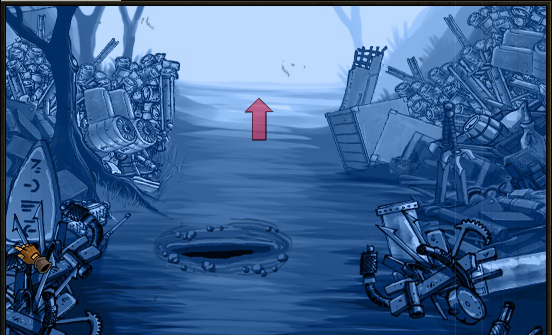 Pick up the STICKS OF WOOD from the pile on the left side of the screen. Click the red arrow to move forward. One of the Dead Race: "You are now in Gorsus, the spirit world." Talk to the dead ancient to learn more about this world and the girl with the auburn hair. There appears to be a path to the left but there is no option to go that way. So, follow the arrow leading forward and to the right. Talk to the Wild Bard. After getting his full story, give your FLUTE to the bard and he'll play a tune, causing the path ahead to open up. Talk to the bard again to receive his gratitude. Follow the red arrow forward. After leaving the bard, you come to a clearing along the path. To the right is a well, a mailbox, and other assorted junk while to the left is a fallen statue and such things. For now, just continue forward. 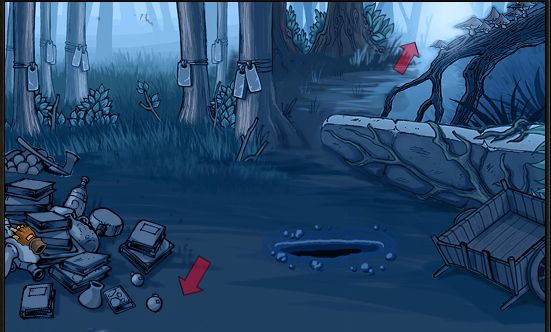 Here you'll see the smooth stones tied to the trees and a cart from Shadetale. Follow the red arrow to continue forward and slightly to the right. In this scene you can see the Shrines for Lethea and piles of more memories/objects. At the moment, all the fire spirit wants to do is talk about what a nice day it is. Take the right path (your only option forward). At this juncture, you see several swords stuck in the ground in front of a tree that has runes skittered across its trunk. There is a path to the right and a path to the left. Take the path to the left. You'll arrive at a large cauldron. Put your STICKS OF WOOD under the cauldron. Go right to the garden of blades. ...end up with a FIERY ARM (which should start a fire all the same). Go forward then take the right path to the Old Shack. Simms, the Runeseeker. "You! You're not dead!?" When you arrive at the old shack, you meet Simms. Talk to him to find out what he believes he knows the way out of here, but he needs a musket ball. Inside the trunk is a green copper box, but so far you don't know how to work it. Use your FIRE to light the wood under the cauldron. Put the LOCKET into the cauldron to melt it. A handful of SILVER SHOT. Go right twice to return to Simms. Give Simms the SILVER SHOT. Go back to the garden of blades. After Simms shoots himself, when you go back to the garden of blades, a demon is there. Talk to him. When you get a choice of response, choose whichever one you prefer. If you choose to lie rather than attack, the demon explains a bit more about what the box is but, in the end, the result is the same: at the end of the discussion, the demon leaves. Take the right path, back to the old shack. Hover over the rightmost symbol to see the clue: "from sun to soil." Then, click the runes in the the proper order. Don't let the design throw you off. Click the runes according to height, from highest to lowest. Then click the "from sun to soil" (rightmost button) last. 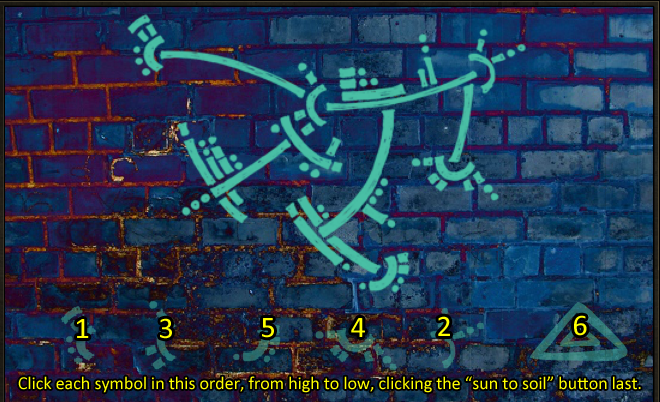 When you've correctly input the runes, the wall will dissolve away. The spiked ceiling is rather quickly descending on you and you need to act fast to stop it. Wedge the SHOVEL into the hole in the upper right corner. After passing safely through the spiked ceiling room, you come to a hallway. Talk to multi-eyed man, Merappi. Take the SMALL BLUE GEM from by the goat head in the left corner of the screen. Get the SMALL BLUE GEM from the top of the door frame. Use your GUN to blast off the first lock on the door. Then, use the DRILL to drill through the second lock. Move forward by clicking the upwards pointing red arrow. At this wall, take the SMALL BLUE GEM from the right edge of the support beam. Your goal here is to change each of the six symbols to match the poem pinned to the door. On the panel to the right of the door, there is a square with two narrow rectangles along its bottom and right edge. The bottom slender metal button designates which symbol you're adjusting. Click it to move from first, second, third, and so on. It goes from left to right: the first= 1 dot, the second= 2 dots, etc.. The button to the right of the square will then change that part of the symbol on the door. When you have the correct set of symbols, an arrow will appear to indicate you can go forward. Go forward through the door, into the cell rooms. 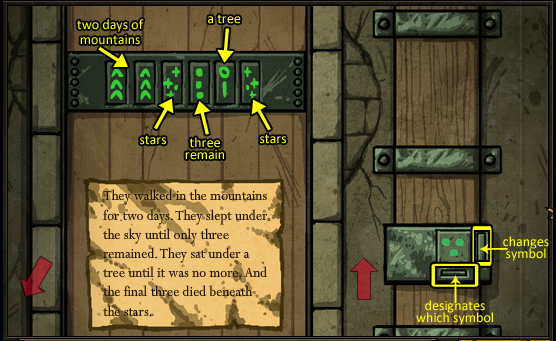 When you pass the "they walked in the mountains" door, you'll see a room with trees and two more doors. one by two rocks at the base of the middle tree. another up in the left branch of that same tree. an the third is in the roots of the tree on the right. Go left to look at the far wall. ...when you do, the lock comes off. Go back to the cell room. Here you can see the fiends are escaping. Go through the left door to meet the archdemon and enjoy the rest of the story. As with many of your inventory items, you can use your shovel on everything just for kicks. But dig in the right spot and you'll uncover some artifacts (a little side quest mainly for the fun of it). The second puzzle where you get to the old box has me compleatly stumped! Can somebody, ANYBODY, tell me how to solve this thing?! Are you talking about the Sun to Soil thing? I'm there too. Definitely stumped. second puzzle? still trying to get past the wall! Any clues on even the first puzzle??? The number of words as the message on the wall have something to do with it? 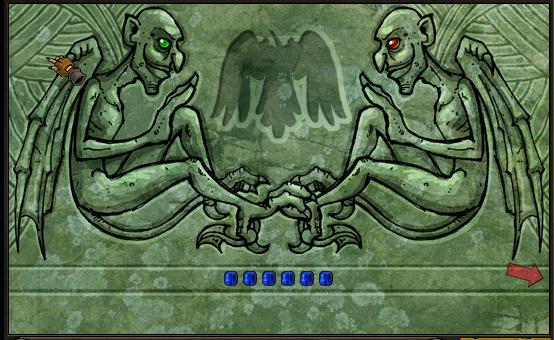 The solution to the first puzzle has to do with the lined figure on the right. I had to play around with it quite a bit before figuring out exactly what they were wanting me to do. Move the horizontal lines to where the spaces reflect the picture on the right. You don't count the dots at the beginning and end. i.e. from the lowest placed rune to the topmost (relative to an imagined y-axis). I have 5 symbols and some sort of chart and something about sun to soil but I've got nothing! HELP!!! Hmmm, that's not working for me. the triangle on the right AFTER you put in the sequence. I'm an idiot. but what doing to activate second puzzle? or tell me, where is musket ball? Please remember to use spoiler tags, folks. Thanks! Maybe you can make the musket ball by doing some smelting? ...so still dont know, what now? Did Dora get stuck inside this game? Ah, not at all! It's just a very different kind of game. Trust me, we here at JiG got stumped by some of these puzzles, too. Eh, new comment system? Why did I reply to another comment? Nathanyel, there's a checkbox underneath the sign in for leaving a comment that you need to uncheck to not reply. @Nanthanyel and hopbitters: I've disabled the comment reply checkbox for now. Reply commenting isn't quite ready for prime time here yet. I apologize for the confusion/issues. I wasn't aware of this series. How convenient it is to discover something nice and have three more games to play! I am clicking the triangle button after the runes. Is there going to be any indication that I've input the right code? If you are clicking the correct code, then click the triangle symbol last, you'll know it because the wall dissolves away and you can move forward. Hey! Thanks for the brilliant walkthrough! It was perfect for when I was stuck nearer to the end. Thank youu!! There seems to be quite a few re-imagined fairytales in games and media these days, and I'm enjoying the twists on the traditional story. Kudos to Hyptosis, and hope to see more in the future. The series was very well done. The art style was unique and lent well to the atmosphere of the game. Puzzles were just right. Gameplay was a bit linear, but excusable in light of the fact that this is a very story and text-driven game. All in all, loved it. "I don't know who Dora is..."
"But she must be pretty great!"